WHY YOU SHOULDN’T KISS YOUR PET LIZARD…OR SNAKE! Lizards and snakes are increasingly popular pets in Australia but keeping one can come with unexpected dangers according to reptile experts. Dr Brendan Carmel and Dr Robert Johnson will talk about the hidden dangers of salmonella poisoning when they present their lecture What can I catch from my pet reptile?at the Australian Veterinary Association Annual Conference in Adelaide this week (15 - 20 May). "The dangers of Salmonellosis have been known for some time, but as the popularity of reptile ownership grows in Australia cases of severe poisoning have increased," said Dr Carmel. "Salmonellosisfrom reptiles can cause serious illness in humans, with people who are infected developing diarrhoea and abdominal cramps. The illness usually lasts from four to seven days and can lead to hospitalisation in severe cases. "Unfortunately, evidence from international studies shows that infants and young children are the most likely to become infected, and people with immune deficiencies such as organ transplant recipients and those with diabetes are all in the high risk group," he said. Estimates of how common salmonella infection is in reptiles vary greatly, with some experts stating that most reptiles are salmonella carriers. "Typically, animals tend to shed the bacteria during periods of stress by factors such as transportation, crowding, food deprivation, exposure to the cold and sudden change of feed," he said. "The key message that we need to get across is that reptiles are cute but they can be contaminated, and people need to take some fairly basic precautions to protect themselves," said Dr Carmel. - Always wash hands after handling reptiles or cleaning their vivaria (living enclosure). - Never eat, drink or smoke when handling reptiles or cleaning their vivaria. - Waste water and faecal material should be disposed of in the toilet instead of the bath or kitchen sink. - Children less than five years of age should avoid contact with reptiles and households with children less than one year of age should not own reptiles. - Do not allow reptiles to roam in the kitchen, dining room, bathroom sinks and baths, to any area where humans bathe or any other area in which food is prepared. - Do not kiss or share food with the reptile. 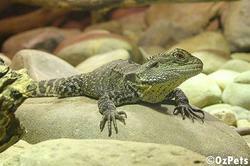 - Follow instructions from your reptile's veterinarian concerning proper diet and environment for your reptile. Healthy reptiles living in proper environments are less likely to shed Salmonella bacteria. Pet owners should consult their local veterinarian for more information about how to take care of their animals and how to minimise any risks.